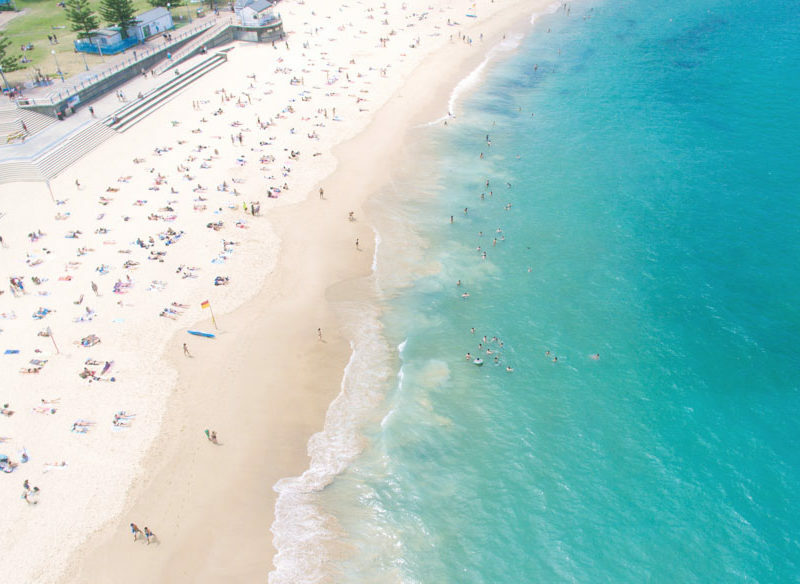 Coogee offers a glorious combination of surf, sun and sand. Gone are the days of Coogee’s English-style pier, Sydney’s ‘Seaside Village’ is all Australian. Here is the best of its surf, sand, shopping, eats and streetlife. Coogee is a place to show that ‘visiting former London colleague’ around, a place to make people from the northern hemisphere green with envy. It’s Sydney – Australia even – at its best; a gorgeous crescent of golden sand fronting sparkling ocean that you can dive into straight off the bus from work. On summer weekends it can look like the last days of Rome, every inch of sand occupied by bronzed bodies, the embankment behind shrouded in the haze from countless barbecues. But it’s not just the beach. Behind it sits a thriving community, serviced by great restaurants, bars and an eclectic mix of shops; home to office workers eager to swap briefcases for surfboards come the end of the day. The ‘Seaside Village’ is in rude health, with one of the city’s best venues, Coogee Pavilion, having opened in recent years.But Coogee has always been in rude health. While it struggled a little during the Great Depression of 1930, its fine natural assets meant that people kept coming to spend their money, arriving on an electric tram to take the sea air. There was even an English-style pier stretching out from the middle of the beach. It succumbed to the surf and was demolished in 1934 after just a few years of use. And before all of this it was smelly. Coogee comes from ‘koojah’, which means ‘smelly place’ to the Bidjigal people, a name describing the stench of rotting kelp on the beach (no longer the case!). Head along the coastal path to Bondi and at Tamarama you’ll find a large rock carving, some 5000 years old, of what could be a whale. Take a walk along the sand and the cliff-tops, explore our top picks, and you will have seen the best of the city, and arguably, her beaches. Don’t stroll past this shop thinking it’s all surfboards and swimwear. Inside you’ll find an eclectic collection of items to help you look like you’re a Coogee regular. There’s everything from Tigerlilly canvas beach bags, Kollab clutches, hats and bikinis from the likes of Seafolly. Plump blue couch in the airy sitting area of Coogee Pavilion Rooftop. A Sydney landmark at the north end of Coogee Beach. The Pavilion is a beast of a venue set under the domed roof of the old Coogee Palace Aquarium, and something of A town hall for Coogee’s transient weekend population. Spacious dining area of Coogee Pavilion. Cali Press; head here for your cold-pressed juices, acai bowls and other wholefoods. You could be in Malibu on a warm afternoon on Coogee Bay Road, and it’s a laid-back, outdoors way of life that Cali Press taps, serving wholefoods in smoothies and acai bowls, cold-pressed juices, and great coffee from its open-to-the-street shopfront. Do your sun salutations with this tranquil view of Coogee beach. The Livingroom (photo: Kaily Koutsiannis). This place is a local institution; you’ll be joining a rough queue (nothing in Coogee is overly formal) on the pavement to get served, but its endless selection of fruit juices, smoothies and crushes justify going shoulder to shoulder with the locals. If you’re feeling a little fuzzy from the Pavilion the previous evening, then a Detox Juice could help: a blend of ginger, beetroot, carrot and celery with spirulina. Sugarcane channels the resorts of Phuket and serves tasty south-east Asian food (photo: Nikki To). “Darlinghurst and Surry Hills are always the places you find new restaurants and I wanted to open the new venue somewhere unexpected, go off the beaten track,” says Milan Strbac, who’s serving up his unique take on south-east Asian food next to the beach. As if competing with Bondi’s famous Icebergs baths up the coast, Coogee has a showstopper of a public ocean bath itself. But unlike Icebergs, Wylie’s retains more of its turn-of the-century charm, with yellow-and-blue-striped changing facilities raised on timber along the rocks. Seafood feast fit for royalty. Crown Plaza Coogee. If you’re spending a weekend near the beach then you want to be within a literal stone’s throw of the sand. The Crowne Plaza Coogee Beach can’t be beaten for location or aspect and is a convenient and comfortable base. Most of the hotel’s 209 rooms afford a view of the Pacific, and it’d be a waste not to have wine on the balcony to appreciate it. Coogee beach is only a stone’s throw away if staying at the Crown Plaza.